Lindsey Hilsum discusses her book on war correspondent Marie Colvin. 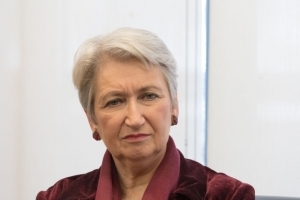 Lindsey Hilsum, author of “In Extremis: The Life and Death of the War Correspondent Marie Colvin,” described her subject as the correspondent who went the furthest into dangerous situations and stayed the longest. Hilsum, speaking at a Dec. 3 book event co-sponsored by the National Press Club's Freedom of the Press Committee and International Women’s Media Foundation, remembered Colvin saying, “War is not high tech in the end. In the end, war is about broken bodies,” when she spoke at an annual memorial for journalists killed while working. She described Colvin partly from experience because, unlike her subject, she was one of those correspondents who didn’t go as far for as long because she did broadcasting and had to get back to the generators. “I needed electricity,” Hilsum said. Colvin reported for The Sunday Times of London, so she could go deeper and take longer for her story, Hilsum said. She told a friend, “This is what I want to do. I want to tell these big stories in this human way,” Hilsum said. Her first big story came from first-hand reporting at a refugee camp in Lebanon to which she and her cameraman gained access by bribing a militia commander to create a one-minute cease fire to let them get into the camp and a second one to let them leave. Hilsum described similar exploits, including one in Sri Lanka, when Colvin rose during an ambush calling out that she was “American, journalist” and was shot in the eye, over which she wore a trademark patch for the rest of her life. Although she continued her dangerous reporting after losing her eye, she developed, and was treated for, PTSD, becoming an advocate for its treatment, Hilsum said.